With 30 years of experience representing companies, non-profit organizations and closely held businesses, John concentrates his practice on business and commercial legal matters, including those arising in health care and real estate transactions. Sophisticated clients and organizations need an attorney who understands their needs and can guide them through the legal nuances of business and commercial transactions. Mr. Matteo, President of the Firm, is that attorney. With 30 years of experience representing companies, non-profit organizations and closely held businesses, John concentrates his practice on business and commercial legal matters, including those arising in health care and real estate transactions. 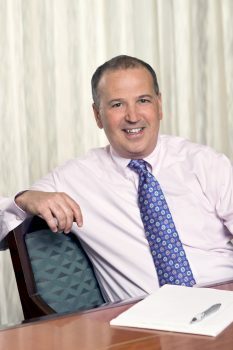 He currently chairs the Firm’s Business and Employment Law Practice Groups and as President, he also serves as Chair of the Firm’s Executive Committee and its Board of Directors, giving him a unique perspective on the day-to-day operations facing any business. John has represented both sellers and purchasers in multi-million dollar acquisitions, including The Washington Club in the sale of its historic Patterson Mansion at 15 Dupont Circle, one of the largest D.C. real estate transactions to close in 2014. More recently, John represented the National Association of Attorneys General Mission Foundation, Inc. in its sale and renovation swap of its M Street headquarters. In 2015, John was confidentially retained by a major D.C. non-profit organization on the sale of its significant real estate holdings in the District. In addition to these significant real estate transactions, John has counseled several companies and individuals on a whole range of business issues, including structuring business transactions, mergers and acquisitions, stock agreements, commercial leasing, real estate, governance, workouts, bankruptcy, and employment issues. John also represents non-profit organizations on similar issues, as well as obtaining tax-exempt status and compliance with IRC 501(c) regulations. Additionally, he has experience with succession and estate planning issues, for businesses and their owners, including the preparation of wills, trusts, living wills, advance directives and family LLCs. John regularly advises hospitals, health care providers, and organizations on contract and real estate matters, as well as particular health law related issues. He has had the unique opportunity to serve as acting in-house counsel support to a major specialty hospital in the District of Columbia, as well as a national trade association in the health care field. Former Board Member, Gala Chair, SOAR!